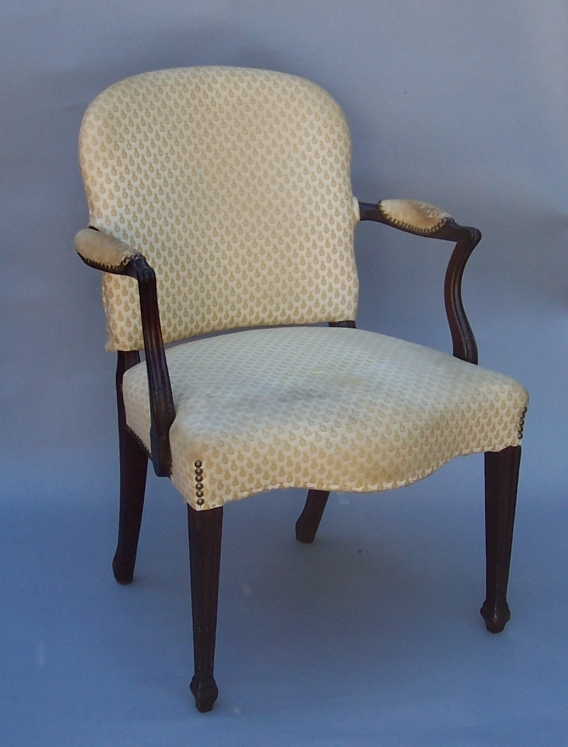 Very fine George III mahogany upholstered open arm chair, with lozenge shaped upholstered back with padded serpentine arms with molded carved hand rests and serpentine molded and leaf carved arm supports, above an upholstered serpentine seat raised on square tapering molded front legs ending in spade feet, with shaped raking rear legs. Rich, dark original color and original condition. Old repair to one front leg. England, circa 1780-90. 35 1/4" high, 24 3/4" wide, 20" deep, seat height 19".